Michael Schumacher zooms through to the top of the podium at French Grand Prix for the eight time whereas my departure to Monash seems to be crawling. Damn the Australian High Commission! yo Schumacher! though he is behind Alonso for the championship. awesome pic! the perfect picturisation of the different colors is jus too kool. and not to mention the clouds displayed a nice array. Nice shot! 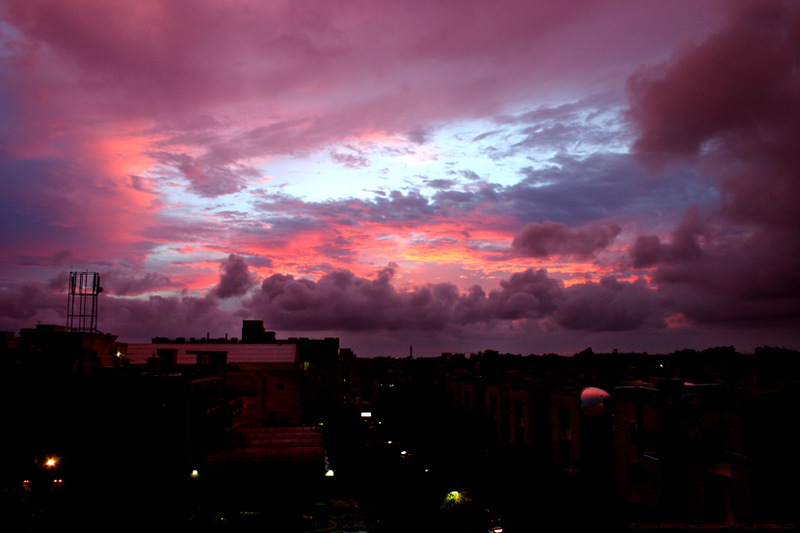 The combination of clouds and Kolkata has always been good. This image is 'daily dose of imagery' kind...Too good! Cool real treat for the eyes, I wonder do you ever click with flash on!! Nag: Yeah I know, but I hope Schumi beats him. We've still got half the season. Rashmi: I just wish I could 'zoom' to Monash too. Abhishek: Calcutta sure has a wonderful 'cloudline'. Varenya: I don't think I can get a higher praise! Hope more and more of my pics become ddoi types. Mohit: You can get a 1024px version from my flickr page linked at the bottom. Souvik: Its very rarely that I use my flash, mostly because the subject is often so far off that my camera's built-in flash would have no effect on it, and also cause I prefer capturing the natural lighting most of the time. Thanks for the huge high resolution version Rungta. I know it must have been an effort uploading the huge file from there! Let the next one be Dawn, as seen from melbourne! dude u get fukin horny wid the sky or wt ?? damn u !! post a few australian beauties ..... be of some use rungta !!! May I add your URL to the blogroll at my website? Varenya: Trust me, I've been trying to wake up in time for capturing a shot of 'Dawn at Monash' ever since you wrote that comment and no luck! I truly love this Photograph. I have been seeing it for many days, though somehow never was able to leave a comment. Especially the symmetry of the left-most-horizontal and the right-most-vertical colour trinity..
Been more than a month since you last updated! I know and I apologize. I don't have a computer as-of-now and that's the reason I haven't been able to update. Without a comp, you wont even be able to empty your compactflash cards.